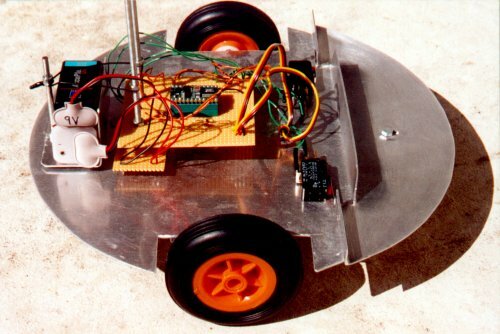 Explorer is an autonomous mobile robot. It is programmed to randomly move, turn and sleep. Chassis: Aluminium plate and steel rods. Wheels: 2 + 1 caster wheel. Micro controller: Basic Stamp II. Motors: 2 modified Hitec HS-422 servos. Power supply: 6V and 9V Ni-Cad Rechargeable Batteries. alignments and use non-permanent attachments. The robot took several months to design and a few weeks to build. I used 3D software to visualise a lot of different ideas. The key design was a circular base so it could turn on the spot. The bumper sensor has been the most difficult problem to solve so far. with an aluminium plate and micro switches.